The POB-TinyProto is a light POB-Proto. Smaller, it have been built to insert easily into every robot such as robosapiens or robonova. o PORTA : 6 digital Input/output or 6 analogical inputs. o PORTD : 8 digital Input/output. o PORTC : 6 digital Input/output. 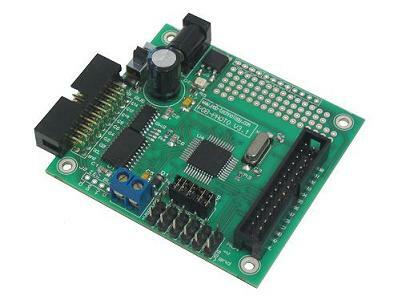 Each pin can control a servomotor. o 1 HE10 male 20 points. Used to connect to the POB-EYE. o 1 HE10 male 22 points : PORTA,PORTC,PORTD, +alim, 5V and ground. o 1 Power connectors for the board. o 1 Power connector for servomotors.